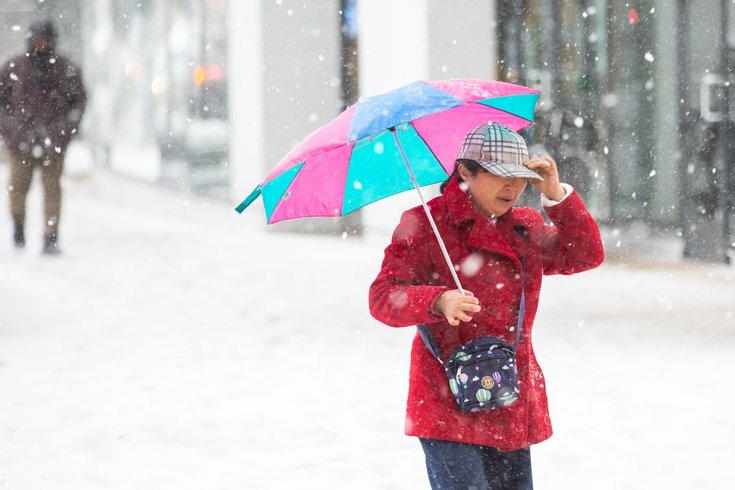 A woman walks along Market Street during a mid-November snowstorm, Thursday, Nov. 15, 2018. Dig out your winter gear and prepare for a potentially miserable commute, because some midday snow, rain and sub-freezing temperatures are in the forecast this week. The National Weather Service in Mount Holly, New Jersey has issued a hazardous weather outlook for the Philadelphia region for Tuesday through Sunday as predictions for snow, rain and icy roads throughout the week loom over the forecast. Looks like we could get some snow then rain on Tuesday before snow kicks in again around 9 p.m., giving us anywhere from an inch or two in accumulation that night. The NWS is warning drivers that roads may become icy after that point and into Wednesday morning, and we may see another half inch of snow before 8 a.m. Periods of strong, gusty snow squalls are possible throughout Wednesday afternoon as an arctic cold front passes through the region. Any more accumulation will form before the end of the night, so Thursday morning travel should be more clear but frigid with a high near 16 degrees and sunny. Monday: Sunny, high temperature near 35 near 75. Northeast wind 6 to 8 mph. Monday night: Cloudy, a low around 26. Tuesday: Chance of snow before 9 a.m. during the morning commute, then a chance of rain and snow between 9 a.m. and 10 a.m., then just rain after 10 a.m.. High near 41 degrees. Chance of precipitation is 80 percent. Little or no snow accumulation expected. Tuesday Night: Rain, possibly mixed with snow, becoming all snow after 8 p.m. Low temperature around 23 degrees. Chance of precipitation is 80 percent. New snow accumulation of 1 to 2 inches possible over night. Wednesday: Subfreezing temperatures with chance of snow showers. Mostly sunny, with a high near 28 degrees. Breezy, with a west wind 8 to 13 mph increasing to 15 to 20 mph in the afternoon. Winds could gust as high as 31 mph. Chance of precipitation is 30 percent. New snow accumulation of less than a half inch possible. Wednesday Night: Very cold and mostly clear. The low temperature will fall to around 7 degrees. Thursday: Sunny and very cold. High temperature will be near 16 degrees and the low will be around 11. Friday: Chance of snow after 1 p.m. Mostly cloudy, with a high near 25. Chance of precipitation is 30 percent. Low around 17 degrees overnight. Saturday: Mostly sunny, with a high near 32. Overnight low around 23. Sunday: Mostly sunny, with a high near 43.